The city is divided into two halves the districts of Shaharah and of Al-Nadan. The city of Shaharah is situated in the top of Shaharah mountain, high up in the sky. Many tourists go to Shaharah to enjoy the view of its famous bridge, distinguished by its artistic architecture. The bridge was designed and built by the builder Ostta, who is known to people as Saleh in 1905. 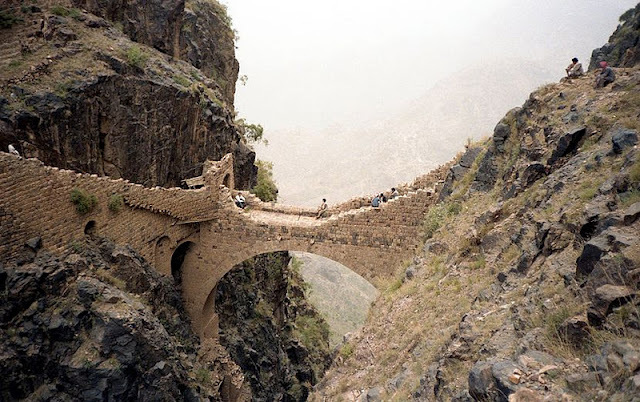 The bridge was built on a sloping groove cut into the rocks, to connect two very high mountains: the Mountain of Shaharah Al-Faish and the Mountain of Shaharah Al-Ameer.